Your Authentic Family Crest is first researched by our skilled heraldic historians from our own personal library of armorials (heraldic books), or else we also have access to the records held in the British Library and the various College of Arms within Europe and the United Kingdom. Upon finding a Coat of Arms for your chosen surname we will request one of our highly skilled heraldic artists to begin illustrating the Coat of Arms, this is done from the original heraldic description that has been recorded for your surname. Our artists always illustrate within the bounds of heraldry, by only using the traditional tinctures (colors), charges (symbols) and other elements as used by the original heralds many 100's of years ago. This ensures that you get a traditional looking Coat of Arms but drawn digitally on a PC to ensure that the quality is the highest possible. 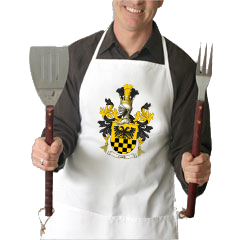 Useful in the kitchen or at the BBQ, our medium length aprons will help keep spills and splatters off your clothes. Includes neck ties and extra long waist ties. Two center stitched bottom compartment pouches allow you to keep cooking tools and recipes handy. 35% Cotton / 65% polyester blend, twill fabric. Machine washable and guaranteed. 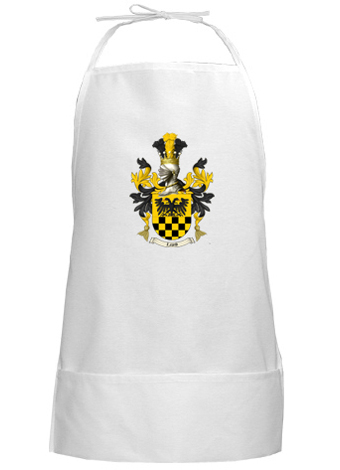 The Family Crest is printed in the center in full heraldic color. 35% cotton / 65% polyester blend.